It was a beautiful Saturday and the beach was calling me. It takes a lot to keep me away from the beach on weekends. It is my angst release. My meditation. My chance to try to get ride of all the stress that I have absorbed during the week. A way to escape all of the drama. And even if it’s only for a few minutes, a walk by the water is healthier than anything else I can imagine doing. But today the beach would have to wait. I had something else in mind. 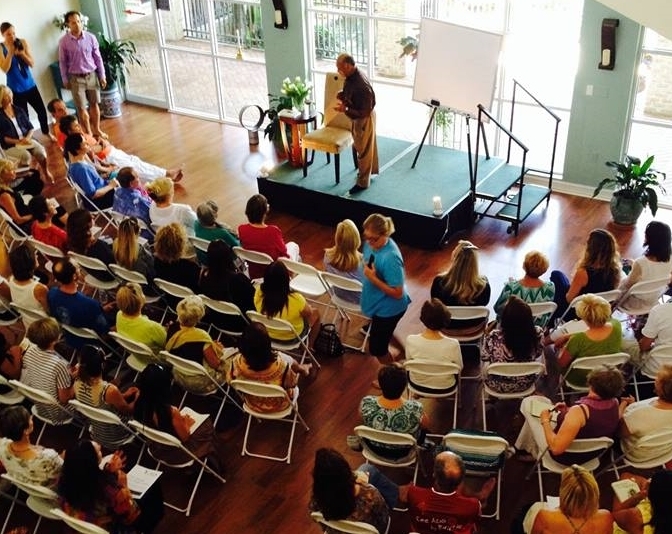 Joyful Yoga and Spa in Bonita Springs had scored a major accomplishment and was hosting Dr. Pandit Rajamani Tigunait, the spiritual head of the Himalayan Institute for a two-hour discussion of his book, The Secret of the Yoga Sutra. This location was only one of 71 stops on his tour. He is a big deal. And I had signed up weeks ago. Hoping for some answers. It has been a year since I walked into Joyful Yoga and happily made a commitment to a yoga practice. For many years I had been a complete exercise fanatic and it paid off with a healthy, strong body. But after endless boot camp classes, high impact cardio and a yoga class here and there, all I had to show for it at the end of the day was knowing that I had to start over again the next day. It had become a drag. I wanted more. "Here in the west, we are so obsessed with the physical aspect of the yoga system that many people are unaware of the larger scope. The physical and mental benefits experienced with a hatha yoga practice is valuable in and of itself. While the effects of your first few yoga classes may last a few hours or even days, it is merely a temporary freedom. Then, with continued practice, you begin to short circuit patterns in the brain that create anxiety as you simultaneously strengthen muscles, establish flexibility, refine physiological responses, and stave off disease and deterioration, but there is still more to be derived from a yoga practice." Imagine being able to short circuit patterns in the brain that create anxiety. Sign me up. So, having given up my day at the beach for some deeper understanding of the Yoga Sutras, I walked into Joyful Yoga and knew that I was in the right place. The studio looked beautiful with bright sun and blue skies setting the backdrop through the huge wall of windows facing north. The water-filled fountain in the garden area was sparkling. Magical. As Emily introduced this modern-day master who has touched lives as a teacher and spiritual leader, I made a decision. I would learn what I learned. No stress or angst. No pressure. And he talked and I listened as he focused on some of the sutras. We know those moments of stress when we have the power to reverse them or slow them down. But most days, we just let them carry us along. Without trying to stop them. And despite all of his beautiful words and calm explanations, the sutras are still difficult for me to understand. At the end of his presentation, just before his guided meditation, Dr. Pandit Rajamani Tigunait said that we cannot be effective if we run around like we are crazy and agitated. We must “let the mind exercise its mastery over the body.” We must get the mind into a state of balance. We must take a break from our frantic lives. Clear the mind through meditation and breathing. It is the only way. A conscious, cleansing meditation. The key word here is conscious. And balance. A reboot, as I see it. When you are in the middle of the storm of anxiety. And this, I completely get. Especially on those days when it's impossible to make it to a beach. Thanks, Joyful Yoga, for guiding me in my yoga practice...on and off the mat. My early morning Joyful Yoga instructor, Marti Dowman, was speaking directly to me this morning when she read this beautiful poem by Danna Faulds. Let it all go. Save your strength to swim with the tide. The choice to fight what is here before you now will only result in struggle, fear, and desperate attempts to flee from the very energy you long for. Let it all go and flow with the grace that washes through your days whether you received it gently or with all your quills raised to defend against invaders. Take this on faith; the mind may never find the explanations that it seeks, but you will move forward nonetheless. you to unknown shores, beyond your wildest dreams or destinations. rest and peace, and certain transformation. It also made me think about a design client who is having a difficult time letting go of possessions from a past (not altogether positive) life as she enters into a new chapter with hope and optimism. We are all holding on to something. A lost love, a dream, the past, possessions...it takes practice (and breathing) to let it go. And then, who knows what can happen. Something great.